Fairmont Rey Juan Carlos I is centrally located within Barcelona, offering convenient access to airports, harbor, train stations and highways to Madrid, France and the coast. Barcelona–El Prat Airport is approximately 10 minutes away. A luxuriously urban resort, Fairmont Rey Juan Carlos I provides guests with a tranquil retreat in the heart of Barcelona. 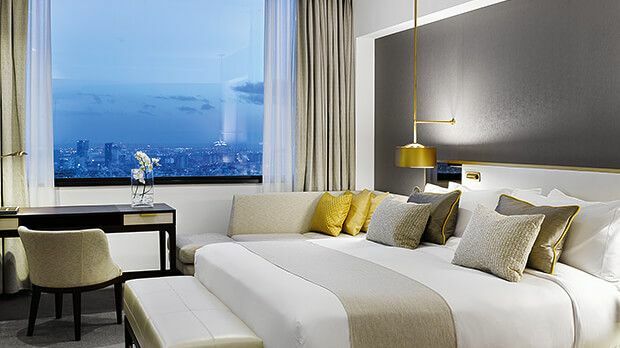 Located on the exclusive Avenida Diagonal, the resort is surrounded by an array of high-end restaurants and shops, along with major attractions such as the famous Camp Nou stadium and Barcelona Polo Club. 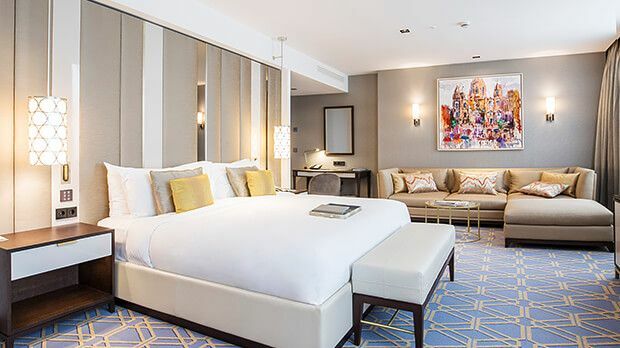 The 395 tastefully decadent guest rooms and 37 suites offer unrivalled amenities, including plush beds with premium linens and bathrooms with separate tubs and showers. 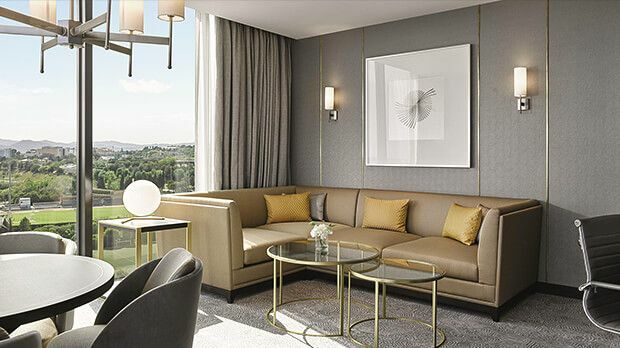 While all of the suites are noteworthy, the recently refurbished Signature Corner Suite features a particularly spacious living room and stunning views across the Royal Polo Club and Barcelona’s skyline. 24-hour room service and in-room childcare service complete the experience. Primed for relaxation, Fairmont Rey Juan Carlos I provides guests full access to the neighboring Royal Club Fitness & Spa. With both indoor and outdoor swimming pools, a steam room, sauna and hammam, it’s not surprising that this club was named one of the top 10 fitness centers in the world by Condé Nast Traveler. Send an availability request with your requested dates to the Fairmont Rey Juan Carlos I. 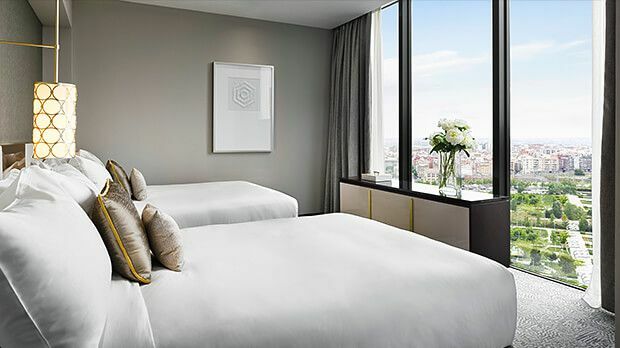 Features 1 King bed, city view, shower and bath, Le Labo amenities and Wi-Fi Internet. Features 2 Queen beds, city view, separate bath and shower, Le Labo amenities, TV and Wi-Fi Internet. Features 1 King bed, city view, exquisite decor, Le Labo amenities, TV, shower and bath and Wi-Fi Internet. Features 2 Queen beds, city view, exquisite decor, Le Labo amenities, TV, separate shower and bath and Wi-Fi Internet. Features 2 Queen beds, separate shower and bath, Le Labo amenities and Wi-Fi Internet. Features 1 King bed, separate shower and bath, TV, Le Labo amenities and Wi-Fi Internet. Features 2 Queen beds, separate shower and bath, TV, Le Labo amenities and Wi-Fi Internet. Features 1 King bed, TV, Le Labo amenities and Wi-Fi Internet. Features 1 King bed, city or Polo Club view, living room, additional toilet and Wi-Fi Internet. Features 2 Queen beds, city or Polo Club view, living room, additional toilet and Wi-Fi Internet. Features 1 King bed, city or Polo Club view, living room and Wi-Fi Internet. Features 1 King bed, Polo Club view, large living room, Jacuzzi, meeting table and Wi-Fi Internet. Features 1 King bed, Polo Club view, grand piano, living room, private elevator, jacuzzi and Wi-Fi Internet. Features 1 King bed, city view, two bedrooms, living room, private elevator, jacuzzi and Wi-Fi Internet.